Field Day! Probably my favorite contest/operating event of the year. Its no surprise of course, I love portable ops! This year we managed to pull together an operation for the reformed Iowa QRP Club, KQ0RP, just in the nick of time! I planned for a 2A operation but once we got it all set up, it didn't look very feasible so we just did one transmitter but kept the option open to add one later (we never did). We set up at the N0MA Radio Farm south of Central City, IA - about 10 miles north east of Cedar Rapids. 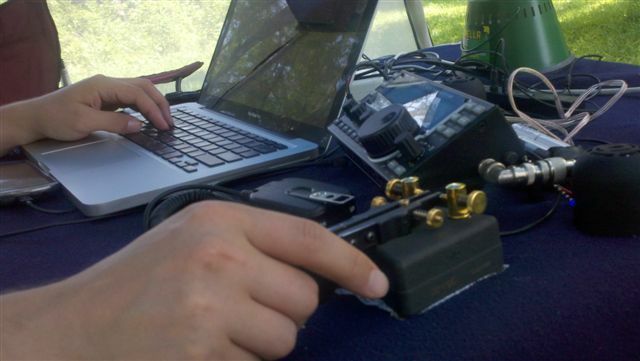 N0MA had their own 100 watt 2A operation going complete with a free VHF station and GOTA. This is where the KX3 comes in. I've heard about all the great features designed for multi-op setups like the ability to block the receiver from extremely strong on-frequency signals, RX shift and many more. Well I have to say, the stories are true, they work so darn well! We were set up only 100 yards or so from the N0MA CW station with identical antenna oriented perpendicular to theirs (running a K3 by the way). Ideally we'd have been in line but the trees we used did not support that configuration. So needless to say, the interference we were subject to was about as bad as it gets. Yet, rarely was my receiver overloaded to the point that operation was impossible. In fact, when using the RX Shift, it pretty much eliminated any interference. Long story short, I was incredibly impressed with the results. Couldn't have asked for more! I treated the event as a trial by fire for the battery consumption too. I have a couple battery options and I wasn't sure how well they'd work with the KX3 for a long term operation. It turns out that my 7Ah SLA was plenty of battery for the whole event probably but I used it until about midnight on Saturday - 11 hours straight and it was at about 12.1v, still a fair amount of use left. I knew it'd last a long time, but it weighs a ton and what I really wanted to know was how long the internal batteries would last in a high TX environment like a contest, so after the early morning storms that passed through the area Sunday, I got back on the air at about 9 AM with the 8 - 2100 mAh Eneloop AA batteries. Fully charged, the KX3 read them at 10.5v when I started. I set the KX3 output power to 3 watts to take advantage of the reduced current draw and went at it. For the next 3.5 hours I managed to work 76 contacts before I pulled the plug to get my solar charged battery for my alternative energy bonus. There was still some life left in the batteries, they were at 9.1v and the Batt Low warning had not yet popped up (set at 8.5v). This is good news for your normal /P operation. Not many /P operations that I intend to work 76 contacts so I suspect one could go for 6 hours or so listening more. Pretty dang awesome! I can't wait for the internal charger, that's going to make it perfect. All in all, a great experience as usual! We ended up having several IA QRP club guys stop by and help out, for which I am grateful. I think we've got a real nice club ready to bloom. I ended up with 170 contacts, all but 3 on CW. Special thanks to the many stations who pulled us out of the mud! Until next year!